Two of my most precious gifts. I am thankful for these two bums. 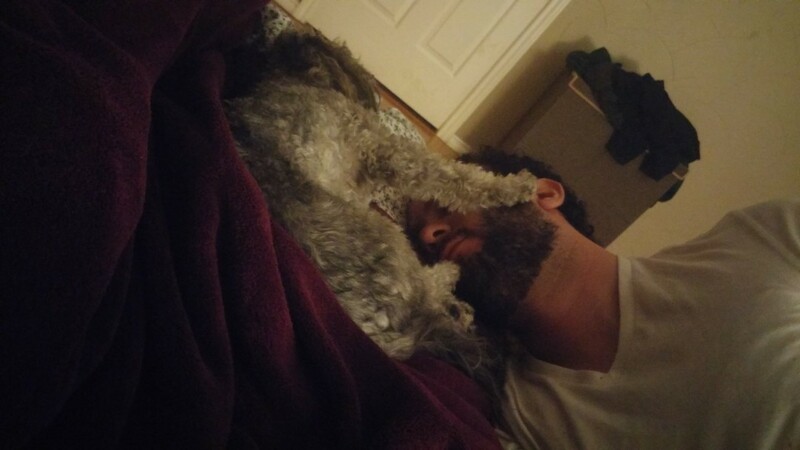 Dog likes to stop Damian when he feels his privacy is being invaded. Before I write anything, I’d like to clarify that I am aware that Thanksgiving isn’t the best of holidays and a lot of people have major beef with what Thanksgiving represents to them. I was born and raised in Puerto Rico so my mother taught us that Thanksgiving was a day to give thanks and be grateful of all the things we’ve been blessed with. In addition, to stuffing our face-holes with all sorts of delicious foods. My mother’s turkey recipe is the best turkey recipe in all the land. I just finished watching a lovely Facebook video posted by the YouTuber Olan Rogers having to do with Thanksgiving. In this video, he mentions he’s had this tradition of making lists of the things he was thankful for. Isn’t that lovely? Wouldn’t the world be a lovelier place if we made of lists of all the wonderful things we should be thankful for instead of fuming about the things that make us upset? Not that there’s no validity or an actual problem with being upset. Everyone has the right to feel whatever it is they’re feeling. Nevertheless, this week is about remember what we’re thankful for and that’s what I’m about to do. My husband Damian! He’s understanding, thoughtful, and loving. I love his gaming face and will continue loving it forever. Our new house! I have a home now. It’s lovely and a lot of work. A lot of people don’t know how much work it is to maintain a home. It’s work I do happily because a house is just a house if there’s no love put into it. The person who invented ice cream. Bless that person! Thank you! We all benefit from your invention. My family. My entire family from my side and my husbands. We’re blessed with a fun yet loving family and I couldn’t ask for a better one. Fleece blankets! Or anything fleece to be honest… Fleece blankets are extra fluff fluff. They make me so incredibly snuggly and happy. Baking! If you follow my blog, you know how I feel about baking or food in general. I love to eat but pastries are my favorite. Video games! I love video games. I will always love video games. I am thankful for their fantastic world and the people who create them. How about dem books? I love books. I love reading. There’s nothing like curling up with a fleece blanket, a pillow throne (which Damian always prepares for me), a Bowser, and a good book. That to me is heaven. This one is a bit existential, in a way, but I’m grateful for learning. I learn something new every day. I work on myself every single day because I know I have faults. It’s not like I’m trying to rectify every aspect of my being but I am continuously trying to be better. MY LOVELY FRIENDS! <3 I have had some really wonderful friends stay with us and I feel so incredibly thankful for them. I love all of them to pieces and cannot wait to see them again. These are my top 10 (or 11 but WHATEVER, I do what I want :D) I’d love to know what everyone else is thankful for. If in the US, how will you be spending your Thanksgiving? If you aren’t living in the US, you still have things to be thankful for so play along anyway! PS. I’ll be uploading a new recipe very soon! I’m off to make it right now. See you soon, everyone!